Microtonal electropop artist Brendan Byrnes recently released Neutral Paradise, a fifty-minute collection of mostly-new tracks. Most of the twelve compositions on record use the 22-EDO system, used exclusively in Brendan’s band Ilevens. His knowledge of the system makes the songs sound natural and easily appreciable to even a neophyte audience. This is the future… Bar that. This is the present of music, and it’s awesome! Belarusian experimental black metal band Leprous Vortex Sun put out По направлению к Солнцу, плавящему изнутри кости (Po napravleniyu k Solntsu, plavyashtshyemu iznutri kosti), in late December of last year. Hinging on heaviness, technicality, and dissonance, the album could probably also be referred to as tech-black. The effluves of Deathspell Omega and Ulcerate are poignant but there’s also a myriad other scents inside this monolithic, mysterious entity. It’s a fantastic album for dissonance lovers. Now, wow… Mungion seems to appose indie pop onto progressive rock and jazz fusion, and it works so well it’s uncanny. Scary Blankets came out last June, and it’s a catchy album that’s still musically intricate and that features a few long-form songs. It’s funky and totally charming – really something you don’t want to sleep on. You need this! 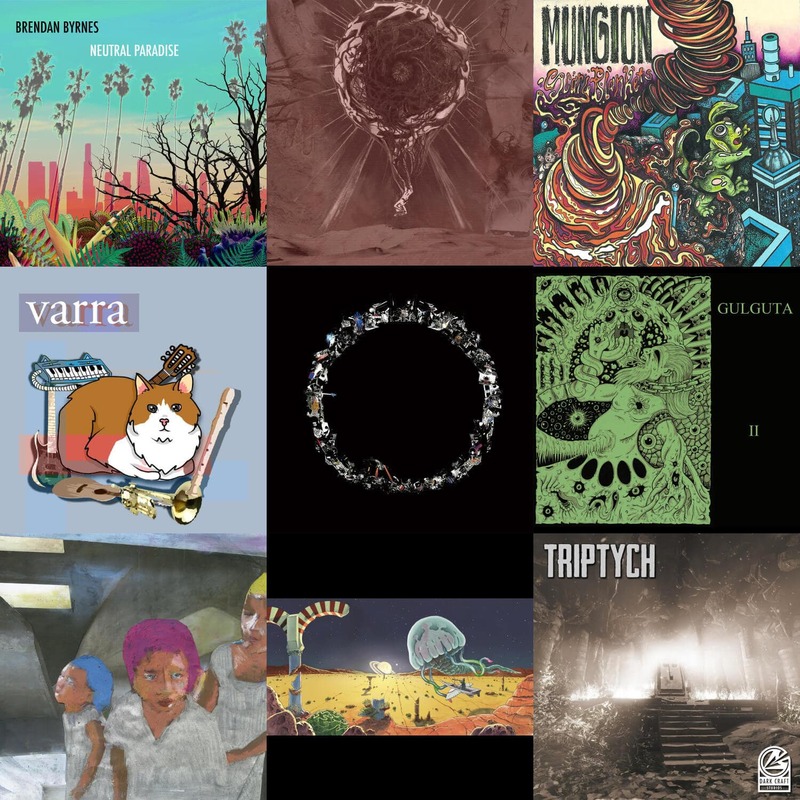 Varra is the name of a one-man jazz fusion band from Chile, and also the title of this ‘demo compilation album’. Given the nature of it, expect the production to be a bit rough, and the cohesion to be quite imperfect, but the songs are very good, for the most part optimistic and with math rock tangents. What I cannot get behind is the price tag, especially since it’s considered as a bunch of demos from himself. You can – and you should – still listen to it on bandcamp, and on Varra’s youtube channel. リビドーと悪魔 (Ribidō to akuma), also known as ‘The Devils&Libido’, is a Japanese math-noise drums and bass duo, and they just released their second album, Devil’s Circle. It’s a pretty interesting little album very heavy on the fuzz and distortion. Gulguta is a Swiss blackgrind trio, and they just released II. I suppose this is their second release, but I haven’t found a thing on the implied I. The seventeen tracks cover the entirety of twenty minutes, all sung in French, and with plenty of blast beats, tremolo picking, and general outpouring of malice. It’s an amazing EP, I recommend you give it a try! סאל חרדלי (Saalhardali) is the artist and album title of this recently-released piece of genuinely mind-blowing experimental math-jazz from Israel. It’s full of saxophone flurries, fuzzy riffs, and general doom and stoner metal vibes. This is without a doubt one of the most unique and interesting experiments of the year, and you shouldn’t sleep on it! Humanity is the latest album of French progressive rock band Draw the Sky. The album is mostly instrumental and very jazzy, in general. It’s very well made, and quite emotionally powerful. This song, ‘Liwo’, for example, oozes of Pink Floyd sensibility, thanks to the heartfelt guitar solo over atmospheric keyboard pads, but then moves away and into the band’s own territory. Humanity is a great album! Triptych, from Jarod DCamp is an orchestral soundtrack to the video game of the same name, from Dark Craft Studios. What’s most interesting, here, is the use of microtonal tunings to reflect the general dread and uneasiness presented in the Lovecraftian horror game. From just intonation to double-Bohlen-Pierce scales, the composer succeeds in creating eerie atmospheres. I also wanted to showcase this because it’s awesome to find microtonal music in more mainstream environments, such as in a video game. Congratulations! On	February 23 2017, this entry was posted.